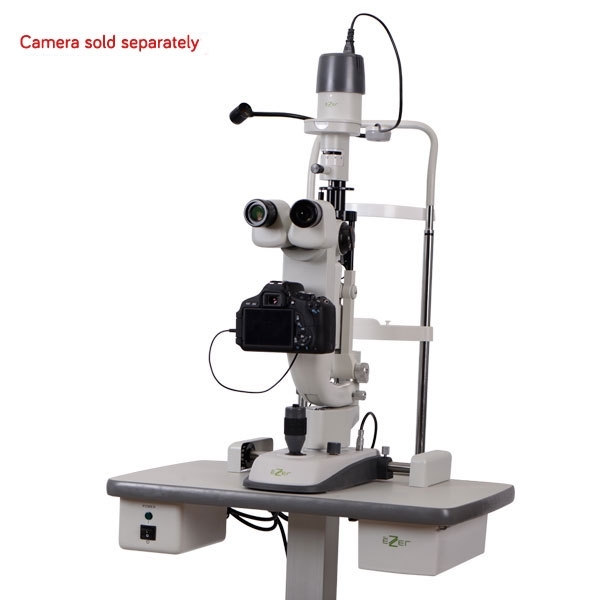 Ezer ESL-9000C Slit Lamp Microscope Single Lens Reflex is the professional image collecting medium for the ophthalmic shooting with sensitive capture of light and color and the complete adjusting functions. With Ezer’s ESL-9000C, you not only get an advanced Galilean converging optical system with outstanding magnification and field of view; you also will enjoy the countless benefits of outstanding image capture with Canon’s 18 megapixel 450D SLR camera (camera sold separately). 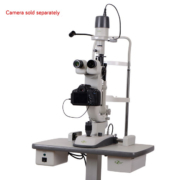 The imaging unit easily and seamlessly attaches to this high-end slit lamp microscope. You’ll enjoy real-time dynamic display on the camera’s 3-inch LCD under perfect lighting that you can precisely control. 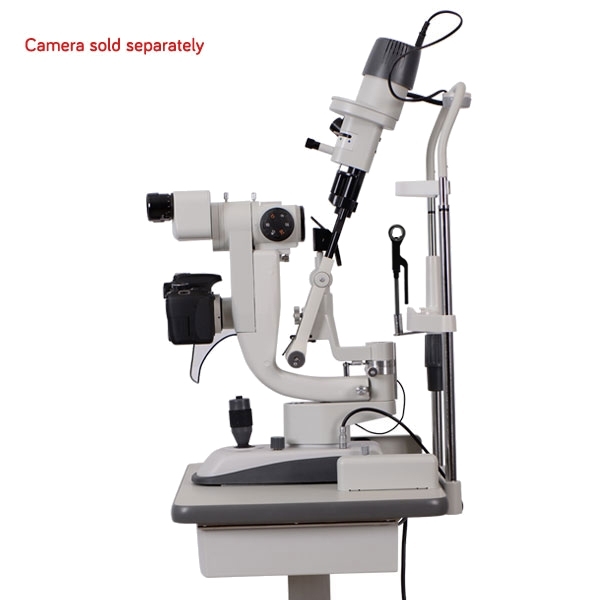 Designed in the traditional tower style configuration, the ESL-9000C offers a five-step revolving drum that allows for an easier exchange of the magnification levels than exchanging an eyepiece. 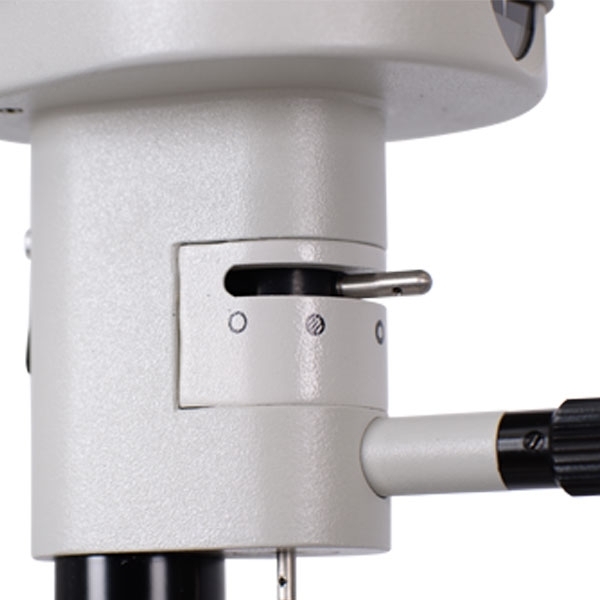 Using the unit’s Accessories Mount, the ESL-9000C can be equipped with a Goldman applanation tonometer as well as several other accessories. 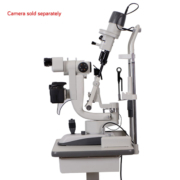 The ESL-9000C also comes equipped with two reflecting mirrors, four built in filters, two fixation targets and a Hruby Lens Kit. If you’re looking for more in a slit lamp, look no further than the well-equipped ESL-9000C. 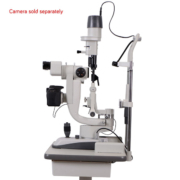 The ESL-9000C Slit Lamp with Camera allows you to capture outstanding images and view them on the LCD display of the attached Canon 450D SLR camera. You can control brightness for outstanding picture quality every time. Ezer’s ESL-9000C Galilean converging optical system offers a very large binocular field of view of Ø33mm, Ø22.5mm, Ø14mm, Ø8.8mm, and Ø5.5mm, with a 55mm-75mm range of PD adjustment and -5D to +3D diopter adjustment. 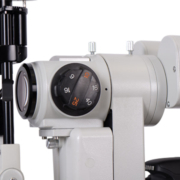 The ESL-9000C offers two options with respect to fixation targets. One is for diopter adjustment to help the patient to see the target clearly while the other is an illuminated fixed spot. 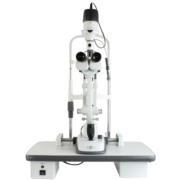 The ESL-9000C features 1x slit projection magnification and enables users to modify slit width continuously from 0mm to 14mm. The slit becomes a circle at 14mm. A helpful scale on the knob indicates the width value. The slit height also can be changed continuously, from 1mm to 14mm. Aperture diameters are Ø14mm, Ø10mm, Ø5mm, Ø2mm, Ø1mm, and Ø0.2mm. The slit angle is continuously adjustable from vertical to horizontal from 0° to 180°. Four steps of slit inclination—5°, 10°, 15°, 20° — also are available for oblique illumination in contact lens evaluations. The smooth classic design of the ESL-9000C allows for precise movements and easy operation of the joystick and knobs. For example, the illumination lever is conveniently located next to the joystick. The brightness control switch can be set to High or Normal, making diagnostic procedures even easier. 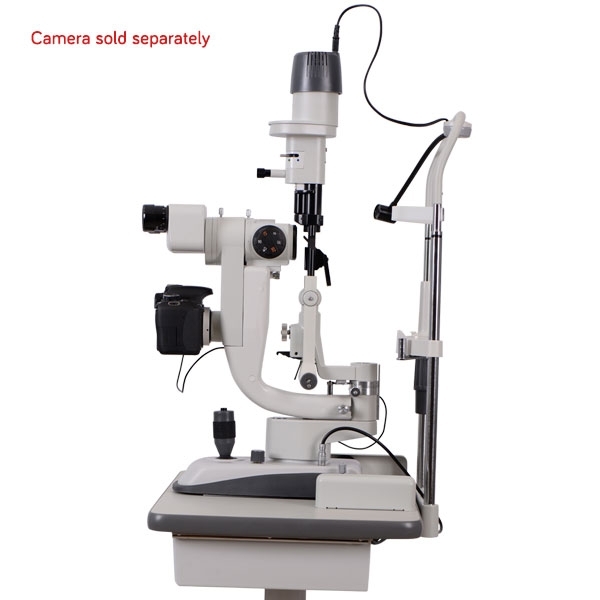 This ESL-9000C slit lamp can be equipped with the TN-150 / TN-150B applanation tonometer as well as several other accessories, including video accessories. Unlike standard slit lamp units, Ezer’s ESL-9000C also allows for a dilated examination of the fundus and the posterior segment of the vitreous body using a Hruby Lens with the unit’s Hruby Lens Holder and Hruby Lens Guide Plate. The ESL-9000C utilizes a 12-volt, 30-watt halogen bulb that provides incredible clarity. Four built-in Illumination Pathway Filters can be effortlessly inserted into the illumination pathway using the selection lever. 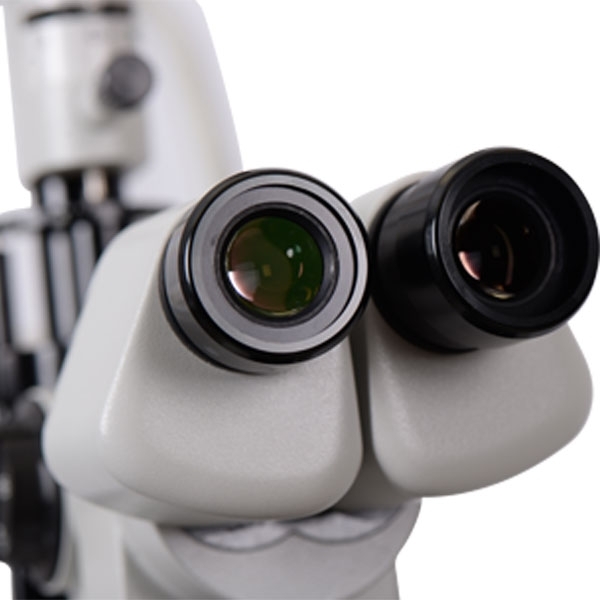 Options include a heat absorption filter that aids in patient comfort during lengthy exams, a red-free filter that enhances structural contrast, a cobalt blue filter for use in fluorescein assessment, and a grey filter. When indirect retro-illumination is needed, you can easily deflect the illumination light using the unit’s well-placed controls. 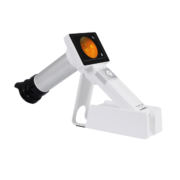 In addition, the ESL-9000C features a diffusion lens for enlarging the illumination field as well as for observation and photography at low magnification. 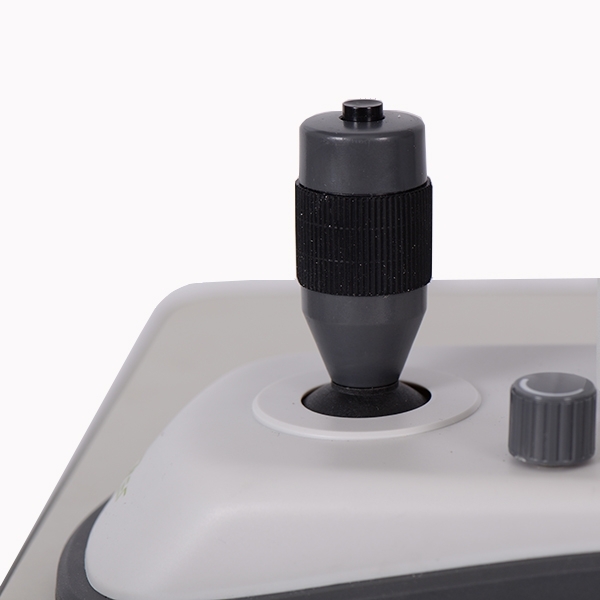 The integrated Joystick is simple to control and allows operators to acquire sharp images using the shutter button. 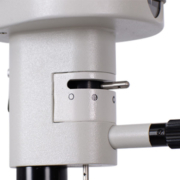 The base operation of the ESL-9000C offers the following movements to provide flexibility, comfort and precision—forward and back movement to 90mm; left and right movement to 100mm, fine movement to15mm and vertical movement to 30mm. 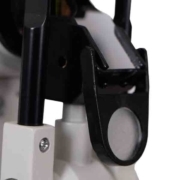 The joystick moves horizontal for fine-tuning and vertical for height and target alignment. Once you achieve the proper alignment, the base can be locked to prevent sliding.